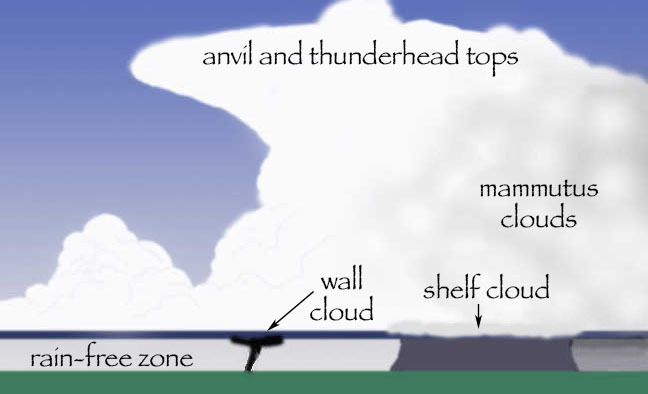 The parts of a tornadic thunderstorm include the anvil at the top, the rain-free zone that is often near a funnel, the dropped-down wall cloud which produces the funnel, a shelf cloud that forms in a location where rain has cooled the air, and bulbous or cauliflower-shaped mammutus clouds. Original diagram by Dawn Adams. Please do not use without including a link to this page or a citation crediting Dawn Adams and Tapestry Institute. Click picture to see a larger image. The National Severe Storms Laboratory estimates that more than 800 tornadoes occur each year in the United States. They have been recorded in every state, as well as in many other countries. In the United States, tornadoes are particularly common in the Great Plains, from the Rocky Mountains to the Appalachians, and they most often form in the spring and early summer. Why and how tornadoes form is still not well understood. Often they form from rotating thunderstorms called mesocyclones. These form when winds in the bottom layer of the atmosphere just above the ground are moving in a different direction, and at a different speed, than winds in the layer directly above. Where the two layers touch each other, the conflicting winds “pull apart” or “shove around” the air at the boundary, until sometimes the air starts to roll over itself. This initial rotating is like that of a pencil if you roll it across a table with the palm of your hand. Sometimes, again for reasons not fully understood, this spinning movement is turned vertically — as if you stood the spinning pencil up on its tip — and if this type of rotation develops in a thunderstorm it is a mesocyclone. Tornadoes then form in several different ways, none of them well understood, from the rotating mesocyclone as the spinning air tightens and speeds up in small, localized regions. One thing that is thought to tip the horizontal rotation vertically is the rising hot air beneath the thunderstorm. Such an updraft fuels the storm’s power. Because of the updrafts, strong winds on the ground that are rushing toward a thunderstorm are one of the indicators that severe weather may be imminent. The sky is also usually very dark, the color of a bad bruise, and the clouds commonly have a sickly greenish cast. Conditions that might spawn a tornado can be recognized long before things get that far, though, by anyone who studies the sky. Towering thunderheads are most likely to produce tornadoes. Heavy rain, hail, and lightning are usually associated with such storms. Tornadoes often form at the base of a wall cloud, which is a lowering of the underside of the thunderhead. Not all wall clouds produce tornadoes, but anyone who sees such signs — especially large hail — should pay close attention to local weather reports for storm watches and warnings. Thirty years ago, tornado warnings were issued when a spotter reported seeing a funnel touch the ground, and since rain and darkness often made it hard for spotters to see them, it was not uncommon for a tornado to suprise everyone in its initial path. 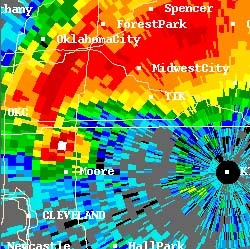 Now Doppler radar is used to pinpoint tornado location and direction of travel with more reliability. Doppler radar image. Click on the picture to learn more. Not all tornadoes are that strong, but some are stronger. The Fujita scale estimates the power of a given tornado by assessing the kind of damage it has done to human-built structures. F-0 is the weakest rating, and F-5 the strongest. 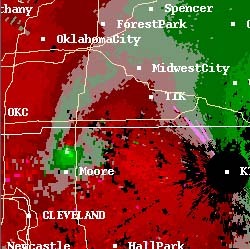 Estimated wind speeds within the funnel itself are based upon what would be necessary to cause the amount of damage seen, and also upon measurements taken by scientists doing research such as NSSL’s VORTEX2. Fortunately, most tornadoes are low-strength. Fewer than 2% of all tornadoes are F-4 or F-5 storms, but they take 80% of lives lost to tornadoes. Seven out of ten tornadoes are F-0 or F-1, and almost all the rest are F-2 and F-3. A newer Enhanced Fujita (EF) Scale is increasingly used to estimate a tornado’s power, with an EF-3 tornado packing windspeeds of between 136 and 165 miles per hour. Like the original F scale, the EF scale is calculated based on the Degree of Damage (DOD) to structures, which means that the power of tornadoes in open country without structures usually cannot be estimated. Most tornadoes can be survived by following National Weather Service guidelines to go into an innermost room on the ground floor of a structure. What should you do if a tornado is nearby? At that moment, the safety of yourself and others in your household may depend on you making the right decision. What you do can even affect others in your community; motorists who blocked highways may have caused injuries and deaths in the 1998 Oklahoma City tornadoes, that could otherwise have been avoided. Continue to Experiential Ways of Knowing and Learning About Tornadoes. Return to Intellectual Ways of Learning and Knowing. People who provided invaluable advice, explanations, images, and editorial assistance to the creation of these pages in 2007, with our thanks. Any errors that might still exist on these pages are solely the responsibility of Tapestry.